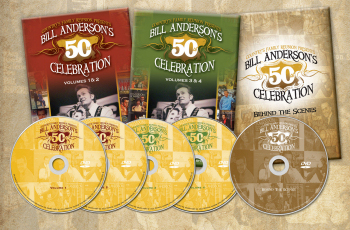 Celebrate Bill Anderson's 50th year in country music! That's right, you're invited to the party-- no one in history has had more country songs recorded than Whisperin' Bill. So, we asked Vince Gill to host a special gathering and recorded it all. Over 7 hours and 5 DVD's we've captured tons of great hits sung by the original artists. This is a party you don't want to miss. For only 79.80 plus 6.95 shipping, this is a special gift you don't want to miss.